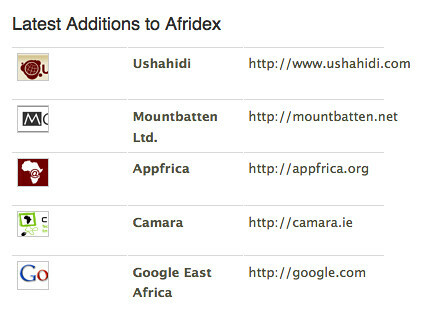 Jon Gosier and Paul Engulu of Appfrica has just launched Afridex, an index of African tech startups. Anyone can submit their website or mobile application and be added to the index. What an excellent idea, and really well executed as well! It’s still brand new, but I think it has a lot of potential – we should see a lot of mobile and web companies adding themselves to the index pretty quickly. As it grows, it becomes more valuable as a resource, thus feeding itself ad infinitum. Persistent Search queries a search engine in combination with select keywords to track mentions of your company around the web as they occur. When any new information about a group appears online it appears here. Blogstream syndicates the ten most recent posts from a company blog. People can also use to follow company blogs by subscribing to the RSS feed. Comments allows consumer feedback and comments about a group or organization. Get instant feedback from your customers, crowd source a product review, or offer public customer service. Brand Watch is a feature that allows users to monitor mentions of a company across various social networks, blogs and websites. 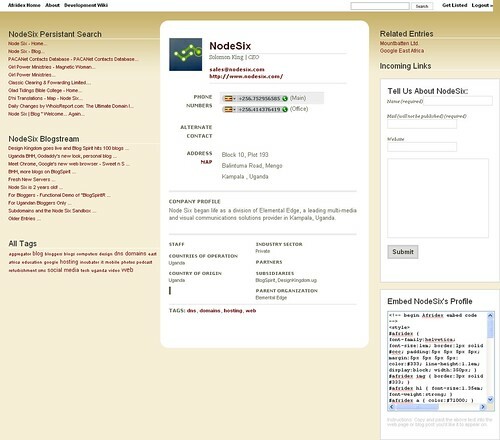 Like persistent search, Brand Watch scans all the popular web portals in africa and abroad for mentions of a company name. Embed allows users to export standards compliant code that will allow them to embed information related to a company in their profile. This allows data from the Afridex to be portable. This information can be used as a quick citation tool for blogs, news articles, email and reports. If you click on any company’s name, you will be taken to the detail page on them. On that page you will find a bunch of publicly available information, including everything from contact information to blog and Twitter posts. It’s really quite impressive. Node Six began life as a division of Elemental Edge, a leading multi-media and visual communications solutions provider in Kampala, Uganda. The only problem that I’ve found so far is that I can’t find a way to either “get listed” (it’s currently a dead link), or create a login so that I can submit a couple companies. I’m sure this is because it’s so brand new, and I’m sure Jon or Paul will leave a note here when that works. I’m not surprised that this excellent idea came from Jon Gossier, I’m starting to expect this type of top-class work from him. I’m sure we’re going to see even more of this in the future. Brilliant.